Explore the underwater world of Curacao by Catamaran. Departing from Blue Bay Beach, we will start cruising along the beautiful coastline. Blue C Watersport comfortably takes you to Curacao's best sites where you can swim, snorkel, scuba dive or just relax with friends and family. During this cruise, you will cruise along the mangroves of Piscadera Bay, a significant breeding place for our marine life. 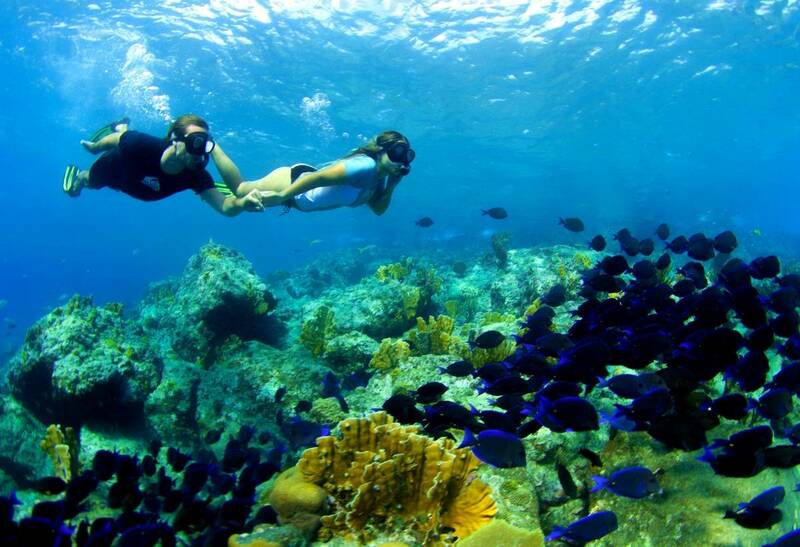 We will make two stops to discover the breathtaking underwater world of the Caribbean. The first stop will be Long Beach, followed by a light lunch of tropical snacks while we are cruising towards the second snorkel site. At this breathtaking bay, we will have time to explore the blue waters again! With an amazing array of tropical fish, vivid coral reefs and friendly sea turtles there is plenty to see! 12:00 AM ARRIVE First site (Long Beach) On arrival the guided snorkel tour commences. With vivid corals & lots of marine life, there is plenty to see! *Alcoholic drinks only available after first snorkel site, combining of alcoholic drinks and snorkeling not allowed.